Vancouver ABFM artist in residence Michael Stockdale at work putting the final touches on this year commissioned official awards painting, “Saturday Lunch at The Old Crow”. After a few years absence, Vancouver ABFM official artist in residence Michael Stockdale brings his considerable creative talent to the creation of the 2016 official event artwork. 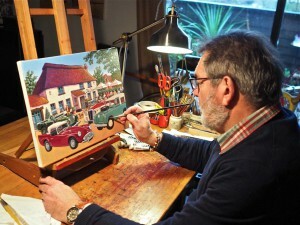 The 12” x 16” framed acrylic painting presented on stretched canvas reflects Stockdale’s intimate knowledge and love of vintage and classic cars. 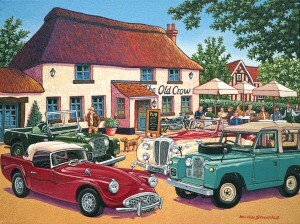 Titled Saturday Lunch at the Old Crow and featuring Daimler SP250, Daimler 4-seater convertible, Land Rover Series 1 & 2, plus a Matchless Silverhawk motorcycle, the setting is typical of Stockdale’s style to tell a warm human story within the main feature of the painting. Stockdale’s work has been called a celebration of life. A very personal vision of his surroundings, as well as a primary importance given to colour and composition, which produces dreamlike, whimsical scenes that engage the viewer’s imagination. To learn more about Stockdale and his work click One Minute with Michael Stockdale.